Controlling Sonoff Smart Switches without internet over Local Area Network is hot topic for Sonoff enthusiasts. After loading any custom firmware to Sonoff, you cannot go back to the official firmware but now you can!!. Just backup your official firmware by following the instructions below and you can restore it later if you want. So Let’s get started..
Download and install Python 2.x or 3.x from https://www.python.org/downloads. Download Esptool from https://github.com/espressif/esptool/releases. Extract the contents of esptool compressed file to C:\. All the contents of esptool should be under c:\esptool. Open Command Prompt (Start > Run > cmd) and navigate to esptool folder. Install the esptool by issuing the command below. It takes few seconds to upload firmware and output will be shown as follows. Now We are just one step behind to download / upload any firmware to our Sonoff Smart Switch. 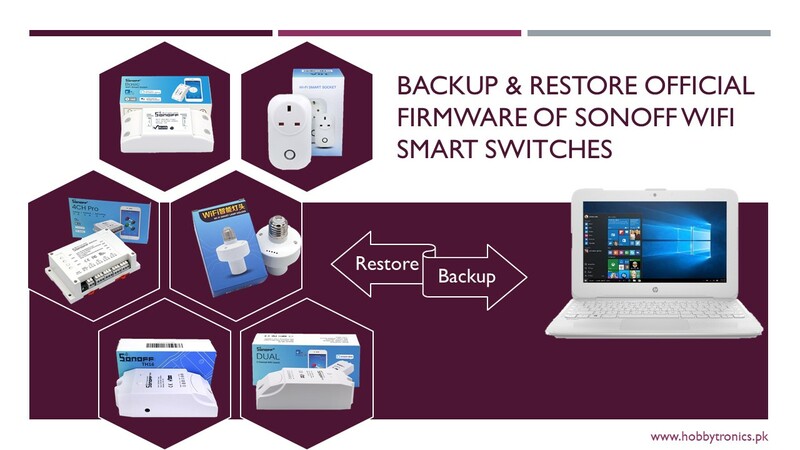 Connect FTDI to Sonoff Smart Switch (For detailed information about each Sonoff Switch, visit Sonoff Smart Switch LAN Control without Internet) and start Sonoff device in programming mode. Now find the port under Control Panel > System > Device Manager > Ports at which Sonoff device is connected. Change COM5 to your own Port. Wait few seconds and it outputs the flash size as shown in picture below Detected flash size: 4MB. Change flash size parameter 0x100000 for 1MB and 0x400000 for 4MB flash. Erase the custom firmware from flash memory before uploading any new firmware. It takes few seconds to erase firmware and output will be shown as follows. Determine the flash size as discussed in Determine the Flash Size section. Copy the official / any third party firmware binary file to c:\esptool folder if it is not already there and upload it by issuing the command below. Change flash size parameter -fs 1MB for 1MB and -fs 4MB for 4MB flash. Change sonoff.bin to the name of your firmware file inside c:\esptool folder. Choosing Wrong COM Port will cause the following error. If following output is shown, Sonoff is not correctly connected to FTDI, Check wire configuration or terminals. This entry was posted in ESP8266, Smart Home, Sonoff and tagged backup, download, esp8266, ESP8285, esptool, Firmware, LAN, local, mod, modification, python, Smart, Sonoff, Switch, upload, without-Internet. I have one residual question. Is it possible to write the official firmware, read from a 1M flash onto a 4M flash? The reason I ask is that I have swapped the flash chips (from 1M with 4M flash) on most of my Sonoff basic’s. I would like to restore the original firmware onto the 4M flash chips. I have two SONOFF basic switches both loaded with custom firmware. Using your backup/restore processes, I backed up factory firmware and restored to these two switches. The backup, erase, then restore worked perfectly. However, when I powered up both restored switches, nothing, no lights. What am I missing here. Does backup/restore only work with the same switch? Thanks for your guidance. There may be the issue with flash size. Check Determine the Flash Size Section, updated today. For Martin do you need press button to your sonoff pow and connect power for programming and read. Programmatiin working. I change firmware ok . Test espurna and espeasy work. Revert original with new flash not work . Old flash is burned.. I have double backup. One 1mb and one 4mb. Memory flash is 4mbyte this is Pow sonoff. Check your FTDI connections or cable. You might be connecting RX or TX lines inversely or your Sonoff device is not started in programming mode. ??? Dear not have solution? Change spiffs? Or other ? Have all file for upload? Only Boot ? Have you erased the flash? Have a look on to Erase Flash Memory. Moreover, are you using an FTDI with 3.3V logic to upload the binary file because esp8266 is not 5v tolerant. If problem persists, create and issue at https://github.com/esp8266/esptool/issues. Upon investigation, we found the flash size issue. Check troubleshooting or Determine Flash Size Section above. Check troubleshooting section of post. Great article. Thanks for it. Hello. What are you going to do? Backing up Official Firmware? Yes, I want to make a backup. Change your cable. If problem persists then flash memory might get damaged.